Autumn light is different from summer light: more golden, as light rays lengthen, with longer shadows. While there is time, and while the blue skies we have enjoyed all growing season fade to gray as winter beckons, go forth and catch some slanted sun-rays of autumn. Enjoy the full life of fall. 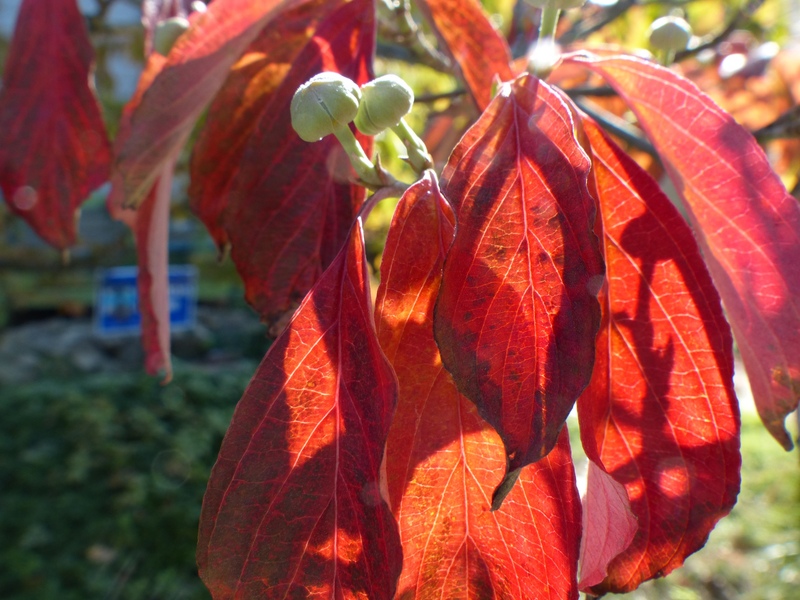 The past few days have brought out the colors of flowering dogwood (Cornus florida), often neglected when the best fall foliage plants are listed. As the lead picture shows it is wonderful now, and its fat flower buds promise springtime reprisals. Next, enjoy the soft foliage of chestnut oak (Quercus prinus), a rocky ridge oak for Ohio which has soft, rounded-lobe foliage and attractive acorns. The picture here is from Mt. Pleasant in Lancaster, Ohio, right now overlooking the last county fair in Ohio in Fairfield County. Wait – next it is not a tree – but rather a tree-man if ever there was one, with retired Secrest Arboretum curator Ken Cochran, ever with a spring in his step, lighting up the season with his smile. For the insect world, below is autumn light and one more look at the redbud leaffolder, Fascista cercerisella, that Joe Boggs detailed in http://bygl.osu.edu/node/592. The entomological authority who first named this insect in 1872 obviously was not channeling Mussolini, who had not yet been conceived but, really – Fascista? What were they thinking? Actually, I know Joe will tell us. Nevertheless, in this hyberbolic political season like no other – I think something must be amiss. Let us step out this week and next with picnics, and kites, and balloons, and acorns, and – spiders!